Some people save for exotic vacations, but me, I save for fashion. A new bag has been on my list for months and I have finally narrowed my choices to two: 3.1 Phillip Lim's Pashli satchel and Alexander Wang's Emile tote. Considering they both retail for under $1000 I think I'm being relatively frugal - or so I will tell my boyfriend if he ever finds the receipt;) Both designers make some of the most downtown chic clothes on the market and both handbags have been coveted by celebrities, models and blogger "it girls". I'm veering towards Mr. Wang's new suede and croc embossed Emile, BUT there is something about the jade green leather on the Pashli that is calling my name. So...what's a girl to do? The Pashli or the Emile, which one is your favorite? Haha, girl I totally get it! I personally would prefer the Philip Lim, but I want to see pics of which ever you get! the Pashli is really speaking to my heart... I am instantly obsessed. So chic! I would go for the 3.1 Phillip Lim's Pashli satchel ... it reminds me of Celine but still it is unique! I prefer the Philip Lim one! They are both so fabulous but I think I would pick the Wang ! Either one is a winner! I personally adore the Philip Lim bag but mainly because of the color and the fact that I prefer angular bags to round ones. But ultimately, it's your call! Either one is super cute! I think I like the Pashli. It's almost making me forget about a Celine bag I'm lowkey coveting. Awe man, this is not fair!!! The Pashli is a totally rad color, but does it have a shoulder strap of any kind? For me, if i can get my arm through to rest it on my shoulder then I am happy, but when it's limited to just a hand carry bag I get a little crazy sometimes! Either one you can't lose, as long as it's comfy, cause they are both fab! This is a tough one...they are both amazing bags!! I personally like the styling of the Phillip Lim one better & that color is to die for! I am a sucker for satchels. :) Keep us posted on which one you decide on. I would kill for the Phillip Lim!! The Pashli its killer; leather with the gold accents and zippers and that emerald green: divine! Most definatly the Emile!!!!!! LOVE that bag!!! same her, I save for fashion too. I have the 3.1 Phillip Lim satchel ( in navy blue) and Selvia has the Alexander Wang. Either one, will be the good buy. My opinion is if you like classic then the Phillip lim , A.W more trendy & edgy. I would go for the Alexander Wang! I love the Phillip Lim one! new follower on bloglovin and GFC! Would you follow me back??? The Philip Lim one, definetly!!! I LOVE The Pashli!!!!! it is beautiful and that green is so unique in color! I love them both but I'd go for the Philip Lim one! I love them both too but I am very drawn to the Pashli one! But you will be the one carrying it so you must LOVE it! Great choices! I like the structure of the Pashli best. Jealous! I love the Pashli as its more structured and I prefer that in a handbag! Yeah, I can't make up my mind. A very hard choice. Must I pick one? I lean towards structured stuff, so I guess Philip Lim is my choice. I vote for the Pashli -- so pretty! Philip Lim, its on my wish list too! get the Phillip Lim! such a great bag and good structure! Its timeless! ahaha nice sweety,i love all of them! would you like to follow each other? pls visit my blog and i followed back! Definitely the Alexander Wang bag...love it! And kudos to you for being able to save up like that! I am so in love with the bag!!! The philipp lim is my favorite! Perfect color too! 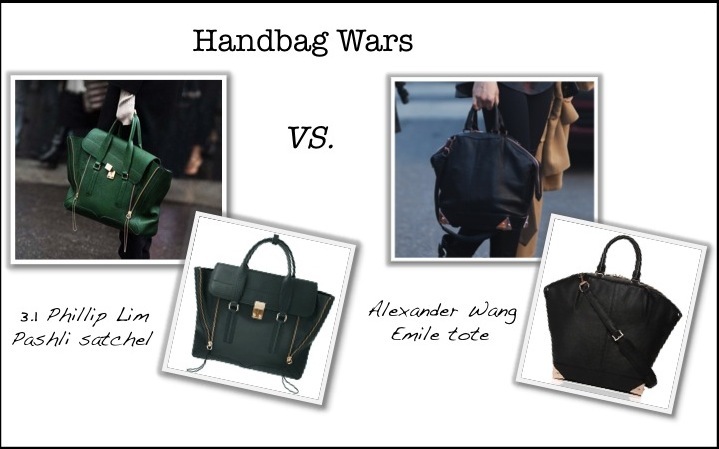 The Philipp Lim is gorgeous, but I do have a soft spot for Alexander Wang too.. Its a tough choice! The Alexander Wang Emile tote, definitely! It's a very difficult decision to make but I vote for Philip Lim; it is just absolutely gorgeous. BTW your blog is fantastic! I do love them both :) great post honey! oooh I am loving the alexander wang bag!! love your blog! I opted for the pashli (pre-order on Moda Operandi made it a little easier to stomach bc you only have to pay half up front haha), but I don't think you can go wrong with either. This purse is really nice, it looks really professional, has a nice color and delivery was quite fast. I really like this handbag because it really stands out.